Answer our House of Cards inspired QOTW! 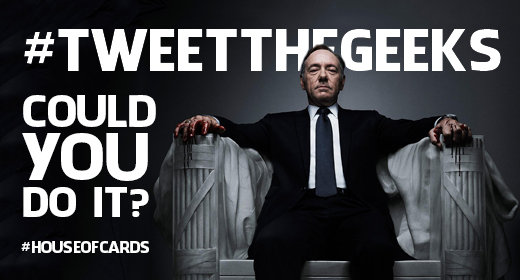 We need your answers for our House of Cards inspired #TweetTheGeeks this week! So, this week’s #TweetTheGeeks Question(s) of the Week: Could you do it? Could you be the President of the United States? Why/why not? Have you listened to our latest episode? We discuss Netflix and net neutrality. Listen to the episode here!